Brad Keselowski and the No. 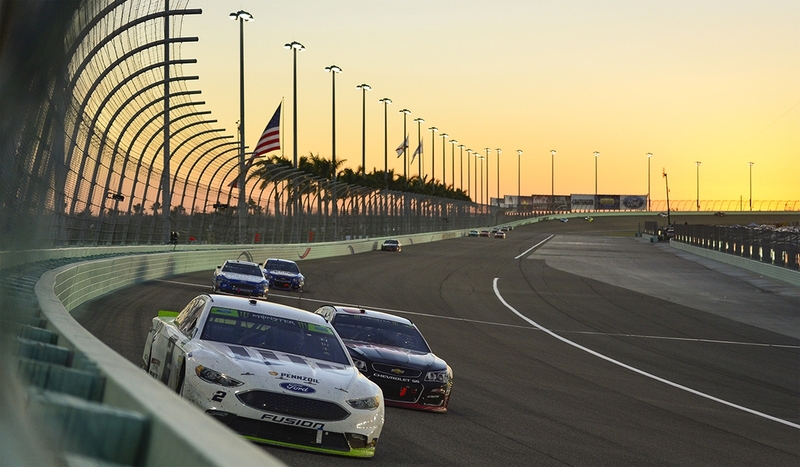 2 Miller Lite Ford Fusion team did all they could to battle for their second championship on Sunday afternoon, but without elite speed, they fell short of their title hopes at Homestead-Miami Speedway. Kes earned a spot as one of the Championship 4 alongside Martin Truex Jr., Kyle Busch and Kevin Harvick, giving him a shot at his second title at the Monster Energy Cup Series level. Unfortunately, his White Lite didn’t have the speed to contend with the Toyotas of Truex and Busch as he finished seventh in the Ford EcoBoost 400 to finish fourth—the second-best finish of his Cup career. BK qualified fifth for the final race of the 2017 season, though Kes knew coming in that his Ford couldn’t match the Toyota muscle on mile-and-a-half tracks. Right from the start, BK and Wolfe went off sequence. A caution flag flew just six laps into the day, and Wolfe called his driver to pit road while the leaders stayed out. Brad restarted 13th at lap 10 and used his fresh tires to carve through the field to second place. He finished the first stage in the second position, first among all remaining championship contenders. As the sun set, the Miller Lite Ford swung loose, causing Brad to slip to fifth place—a microcosm of the race for the No. 2 team, as they never quite had the speed to make it stick up front. At lap 122, Brad pitted from fifth, and fourth among championship drivers. On this cycle, Wolfe elected to short-pit, an action that brought the rest of the field on to pit road. Kes was holding strong in the top-five when Danica Patrick hit the wall at lap 142, bringing the field to pit road. Wolfe’s fitted Brad with a short-run setup on with 10 laps to go in Stage 2, helping him charge his way to fourth with a strong restart. However, he couldn’t hold off Busch toward the end of the run and he finished the second stage in fifth. Kes restarted seventh for the final 100 laps but was bottled up, causing him to fall to 11th on the restart. He worked his way back to ninth before pitting under green at lap 198. The 2 Crew helped vault him to sixth when the field cycled, where he remained when the season’s final caution flag flew at lap 229. The 2012 Cup Champion restarted seventh for the final 34 laps, but he didn’t have the power to advance over the closing laps, settling for a seventh-place finish while Martin Truex Jr. won his first MENCS title.
.@keselowski and the No. 2 @MillerLite Ford team gave it their all today at @HomesteadMiami.